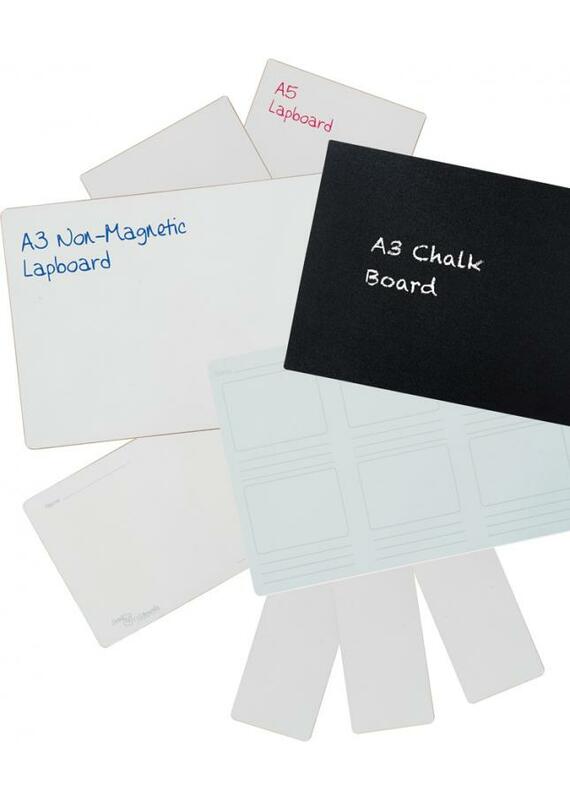 A pack of non-magnetic mini-whiteboards which are rigid and sturdy, and ideal for group work in primary and secondary schools. Lapboards are a great tool to help children with active learning and also help to increase interactivity in lesson time. Manufactured from MDF, these mini-whiteboards are durable and able to withstand daily classroom use. The non-magnetic dry wipe surface is for use with dry marker pens and allow work to be altered or erased easily and mess free. This can help students who may lack confidence in actively engaging in classroom discussions among peers from fear of being incorrect. The A5 size of these lapboards is the perfect size for children to hold in their laps during group working activities. Use these lapboards for activities like brainstorming and spider-diagrams. Using lapboards in lessons helps to reduce paper wastage in schools as they can be re-used time and time again. Lightweight and compact, the mini-whiteboards are easily stored and transported so are a great resource for taking lessons outside. Lapboards have a plain double sided dry wipe surface so can be used on both sides. Available in 2 pack sizes – 35 or 100.